Mama's recipe for classic, old fashioned coconut custard pie. Well, here I am again. With a coconut recipe. I know, I know, I know… I have a gozillion coconut recipes but how can I call myself a coconut connoisseur, or a reliable food blogger, or a Southerner for that matter without a good, old-fashioned recipe for coconut pie? Before I tell you about this pie, let me tell you how I came to the recipe. Mama has worked for a local jewelry store since before I was born. And so have many of the ladies who work there. They are all like my aunties. They congratulated me when I graduated high school and college, they came to my bridal and baby showers and they were as excited about my adventure to New York with Food Network as I was! They are my cheer leaders and I love them all. And they're a hoot. Picture Steel Magnolias meets Designing Women. A few years ago, these aunties of mine published a cookbook of their collective favorite recipes. Since many of Mama’s are in there, I go to it often. I pulled it out to look for a coconut pie recipe and Mama had two. And I had to laugh at the names. The first is simply called Coconut Pie. The next is called Good Coconut Pie. Hmmm. Well, which one should I make? Oh, I’m thinking I should go with the good one. When I asked her why she bothered putting two in there if she only thought one was good she just laughed and told me to hush up. And your mama's anything like, mine, that's an acceptable answer. Or you better let it be anyway. I decided to blend the two recipes because they both looked good to me. Maybe I should call mine Better Coconut Pie. And if I ever improve it I can call it Best Coconut Pie and then well have the market cornered. Ha! Regular, Good, Better and Best! By the way, if you’d like to get a copy of their book, From our Table to Yours, email them at staff-dems@sc.rr.com or call 803-407-5290. The books are $20 and they’ll ship one to you! Add sugar, butter, eggs, flour and salt to a large bowl then beat with an electric mixer until creamy. Add milk and extract and mix until thoroughly incorporated. Stir in coconut. Pour filling evenly into pie pastries. Bake at 350 degrees for 45 minutes or until golden brown and set in the center. From a Tiger fan to a Gamecock fan... I put the rivalry aside and still just adore you, your page/site, and recipes! I wanted to crawl in my TV and smack Cat Cora. You're that southern smart a... alec that I love ;) Keep doing what you do! I just love your webpage and all of your recipes! I love all things Coconut and I would love to have that cookbook! I collect cookbooks. I would surely love to add that one to my collection. this would be the BEST Mother's Day Gift - the gift of Lovin from the Oven!! I am such a huge fan - I try a lot of recipes and they are all delicious!!! I love coconut pie. Yum. that pie looks aw-suuuum! im gonna try & make it next weekend! I adore coconut recipes and I adore eating them even more. Thanks for sharing as many as you can! A girl can never have too many cookbooks, and that one sounds like it would be a great addition!!! Love the blog, Punkin' ... Keep up this most excelent celebration of Southern Cooking & Southern Culture! Oh man, do I LOVE Coconut pie. 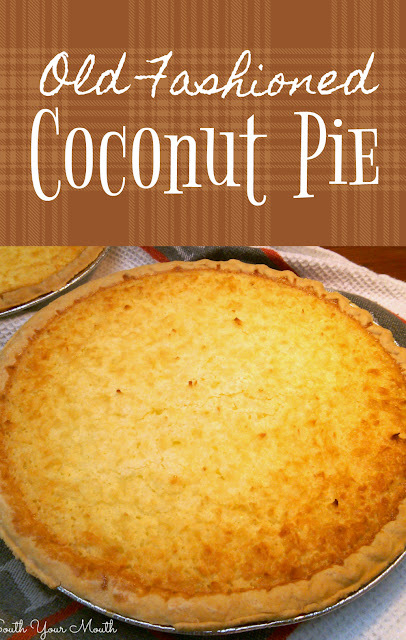 I don't have a coconut pie recipe--but would love to try yours. Please enter me in your giveaway! So glad I found you site. So many wonderful recipes. Thank you for all of your hard work and for sharing. This pie looks awesome! I love your blog and recipes. Pick me please, lol! OMGoodness! I must have this book. A friend is getting married in 2 weeks & really needs it. 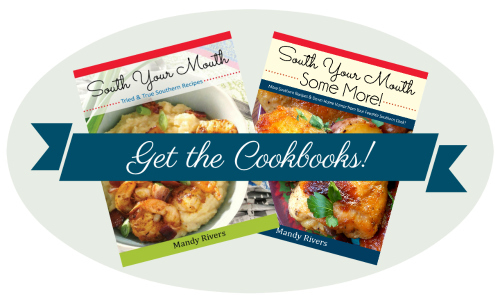 I would enjoy thiscook book as much as I enjoy your South The Mouth recipes and posts. Pick me.....Pick me....Pick me....I LOVE your recipes and would love and be honored to have a copy of this cookbook. My email address is susieqself@yahoo.com. What I would really love to see is you on QVC once you get your cookbook written. I know your recipes would make David Venable do his "happy dance". Thanks for sharing and for all of your hard work!!! Please choose me... I would be honored to add this book to my collection...being a transplanted SC girl and with my birthday being this Friday ;-) and coconut pie being my favorite, I would be happy to taste test any and all recipes! I can't wait for your cookbook to come out, but I bet this one is good as well!! These are some of the most awesome recipes I've ever made,please keep them coming. I also would love to have one of your cookbooks. Thank you so very much. If the recipes in this cookbook are anything like the ones you blog about...... I'm all over that! I try so many of your recipes, they all have been great!! I would love this cookbook. Love your recipes and stories! Keeps me connected to my Southern roots! Looking forward to your cookbook. Man, I gotta make that pie this weekend! I love cookbooks like that...always have the most incredible recipes...comfort food at its finest!!! I am a coconut-holic and this recipe is on my list to make this week! Yum! 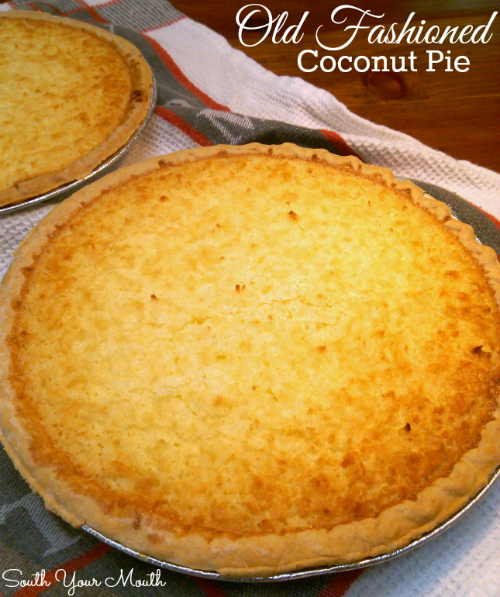 I love coconut pie and can't wait to try this one. You have delicious recipes. As a Southerner I must admit I love all of your recipes. And this coconut pie looks fantabulous !! Will be trying this soon ! Love your page and everything you do! Love that you have so much fun doing what you do! Would love a piece of this pie right now!